Chickamauga, GA – Commissioner Whitfield recently signed a proclamation designating October 7-13 as Fire Prevention Week in Walker County. 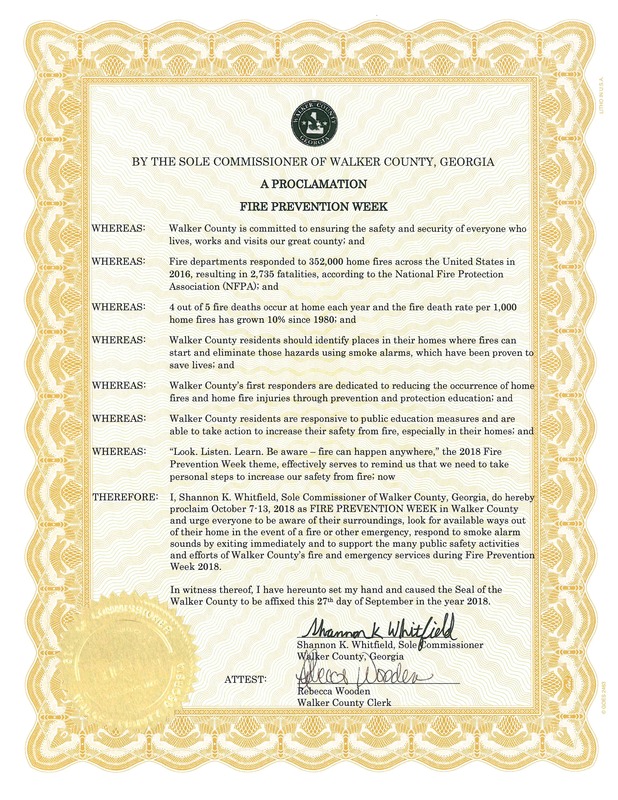 Walker County Emergency Services (WCES) is teaming up with the National Fire Protection Association (NFPA) ­to promote this year’s Fire Prevention Week campaign, “Look. Listen. Learn. Be aware. Fire can happen anywhere.” The campaign will focus on educating the public about basic, but essential ways to quickly and safely escape a home fire. WCES will host a series of events in support of this year’s Fire Prevention Week campaign, including visits to local schools to reinforce the message with our children. Also, if you need a smoke alarm for your home, call or email Regina Dorsey at 706-539-1255 ext 111. She will schedule a time for a firefighter to come to your home and install an alarm for free. WCES does this as a community service with our partner, American Red Cross of Northwest Georgia.